The $93M Hi-Desert Water District (HDWD), Wastewater Reclamation Project, Phase I Collection System project is comprised of a wastewater treatment and reclamation facility, a collection system, and private property connections that will help property owners comply with the State’s mandated septic discharge prohibition dates. It will take approximately 4 years to complete Phase 1 of the Sewer Project, with Phase 2 and 3 to follow in subsequent years. Providing full service construction management services and SRF funding Assistance for 4 bid packages with multiple headings in Phase I identified as Bid Package “A”, “B”, ”C” and “D”. 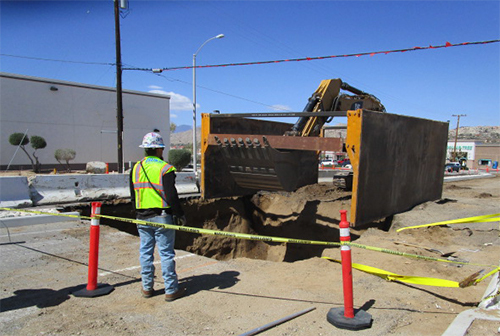 Collection System –Over 75 miles of pipe that makes up the collection system, is currently being installed within the streets of Phase 1. Existing streets where pipelines are installed will be removed and replaced with new roads. On May 13, 2015, property owners approved the formation of Assessment District 2014-1 to secure a loan from the Clean Water State Revolving Fund. The loan allowed property owners to finance their shared cost of the $150M project over 30 years on their property taxes.